With days full of action at the stunning Mottolino Snowpark, workshop “how to increase your rider’s visibility“, relaxed yoga session and epic after contest party, World Rookie Fest will be just incredible! Last but not least, Union Bindings have signed a new sponsorship deal with World Rookie Fest! Welcome on board! It’s less than two weeks and the World Rookie Fest 2017 will open its doors to families, riders and coaches from the snowboard Planet. If you are ready to come and ride or enjoy the show, mark the 14th and 19th of January in your diary! Where? At the incredible Mottolino Snowpark based in Livigno! What can be better than a perfect snowpark set up, fresh snow and great young riders from all over the world? Conditions will be great and all the kickers will be ready to be built in the next few days. Weather permitting, Mottolino Snowpark will be ready with 2 kickers with jibbing obstacles on the M line, 2 kickers for the L line and 2 kickers for the XL line with final jibbing table. World Rookie Fest is not only known for the freestyle action on Mottolino Snowpark but also for its collateral activities. This year, the crew in Livigno is going to host the first Boardriding.com workshop, to give the young riders a little guidance how to make themselves visible in social media and how to create a professional athlete’s profile. “How to increase your rider’s visibility” workshop will be held on Monday, January 16 from 17.00 at Plaza Placheda. We remind you that the WRF program includes on Sunday the Stronger premiere, the Union Binding’s new team movie, winner of the most inclusive award in all of TransWorld Snowboarding Riders’ Poll: Video of the Year 2016! If you still haven’t registered, take a chance and do it. Download the entry form with all the info about program, booking and registration here. We are looking forward to seeing you in Livigno! 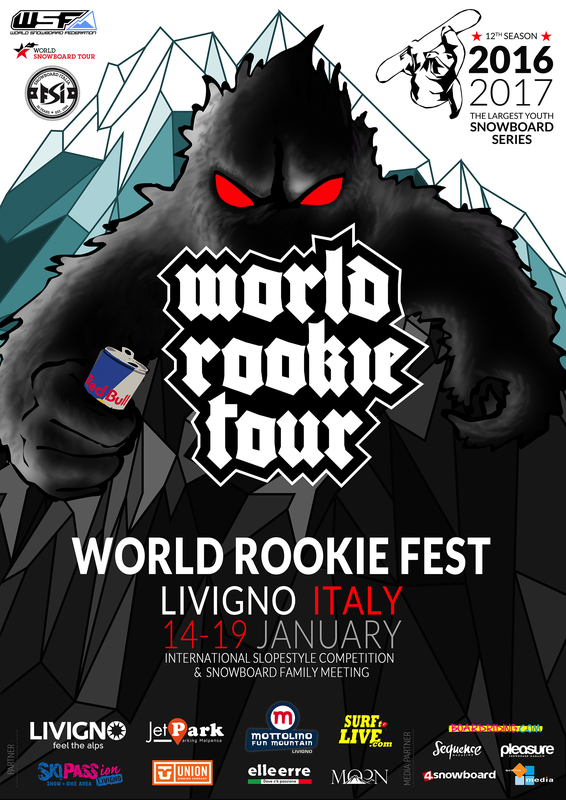 Thanks to the World Rookie Fest sponsors and media partners: Livigno, Mottolino Fun Mountain, Union, Skipassion, Jet Park, SurftoLive.com, Elleerre, Moon, Boardiding.com, Pleasure, 4Snowboard, Sequence, quattromedia. Transilvania Rookie Fest 2017 is ready to go!